Information provided by Bigblah of VGMdb.net/Gamingforce. Review: For those of you who’ve talked to me either in person or online, it should not come as a surprise as to how much I had been anticipating this album’s release. 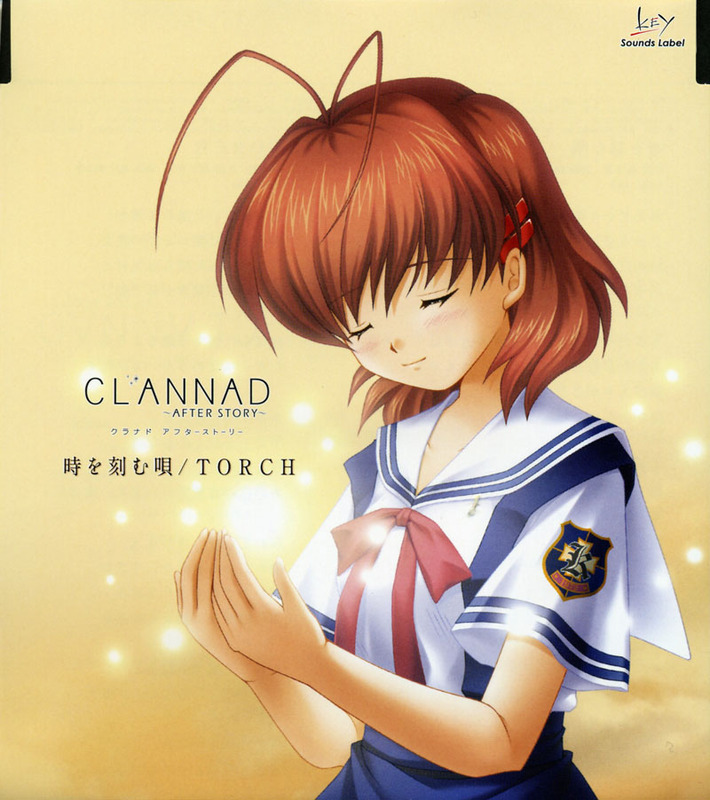 I’ve long been a fan of Lia’s vocal works since I listened to “Tori no Uta” and add to that the fact that Clannad’s game soundtrack managed to deliver a comparable listening experience to Air’s soundtrack (a very good thing) and you’ve got a pretty good record going on. So when I saw that Clannad ~After Story~ would use an arrangement of “To the Same Heights” (Disc 2, Track 5 from Clannad’s soundtrack) with Lia on vocals, I knew we’d be in for a treat. After listening to the song a few times, I can declare “A Song Engraved in Time” to be the best song from Fall 2008’s lineup. Words just can’t describe the heartfelt emotion with which “A Song Engraved in Time” instills within its listeners from its opening chords all the way to the very end of the song. This song starts off by capturing your attention with its brief introduction that lends itself to a rather soothing atmosphere. Then, Lia’s voice enters the picture and the sheer power of her delivery succeeds in entrancing the listener and she builds up the melody to transition over to the heart of the song, which makes its entrance at the 1:03 mark. At this point, the song enters high gear as Lia conveys a sense of loneliness and longing and does so in such a way that’s nothing short of being stunningly beautiful and depressing at the same time. The depths to which this song hits at one’s emotions is just astounding and it’s definitely a testament to the richness of Lia’s voice that brings with it a sort of expressiveness few other vocalists can match. Everything about this song, from the vocals and the piano interlude 1:50 to 2:00 to the refrain that wraps up the song is just poignant and came pretty close to reducing me to tears a few times. There aren’t many songs that have that sort of effect, which demonstrates how well this track does when it comes to delivering a solid, emotional impact upon the listener, making it a wonderful listening experience. Any song that comes after “A Song Engraved in Time” just simply won’t compare and it’s even a steeper climb for “TORCH” since I wasn’t enthralled with the piece when I watched the ED sequence. Its jumpy, celebratory introduction is a jarring transition compared to the heavy, emotional moments that “A Song Engraved in Time” put forth. However, if you force a separation between the two pieces, I think you’ll find “TORCH” to be a decent, competent track even though it’s certainly nowhere as good as the track that preceded it. The opening notes certainly give this song a festive air packed with energy that oddly reminds me of music from any given Mario Kart game just before the race begins and if you’ve paid attention to that ditty, I don’t think the comparison is too far off. Lia enters at the 0:15 mark and the mood shifts from an energetic piece to one that’s a bit mellower where you can sense a buildup, though it’s more subtle this time around. The buildup culminates at 1:03 where the melody shifts back to its joyous introduction before starting the second verse. As I stated before, “TORCH” just doesn’t have the same kind of pull and by having Lia on vocals, the song is passable only because she’s a very good singer. Furthermore, whether it’s because I’m only concentrating on the music instead of being distracted by the accompanying or some other factor, “TORCH” is actually more tolerable in its full version than in the series. It doesn’t change the fact that it will forever lie in “A Song Engraved in Time’s” shadow, but at least it’s not as bad as I had initially made it out to be when I first heard it. It’s albums like this that serve as a reminder of the power that music has upon people. While it’s easy to dismiss most anime OP/EDs as bland, uninspiring J-pop, there are enough songs out there that grab on to you emotionally to make the process of digging through lots and lots of anime music worthwhile. And in this instance, the sheer beauty and poignancy of the music puts “A Song Engraved in Time” in a class of its own. Thanks for the review ^_^. I really like how you interpreted the song and I agree that it’s very beautiful. It’s so mellow and probably when the dramatic moments get more intense in Clannad, I’ll tear up when I listen to this. Thanks for the reminder. I’ve been waiting to grab this soundtrack ever since Ep. 1 aired. Nice review, btw. Keep up the good work. I’m going to try to get an official copy shipped over. I know Torch is highly disliked in the series because it is a sudden transition between sullen plot and upbeat ending song, but it seems alright as a song on its own. Yeah, I don’t think that my reaction to this album will be news to anyone who’s seen the OP. Still, I do hope people give “TORCH” a chance by listening to it alone. Anyhow, glad that you all found this review to be useful! At first I thought Toki wa Kizamu Uta was just a good song, then I learned what the lyrics ment and almost teared up haha. It surprsingly tells the sad story of Clannad’s After Story very well and perfectly fits the mood. Ironicly I saw someone else who said in his blog that the op was the worst song ever and it was so bad it contributed to him dropping the show lol. Interestingly enough, I think that’s where the OP becomes very good. Through Lia’s performance, you get a good feel for what the song’s about even if you don’t understand the words. There’s just something about her voice that conveys the emotions so well. Not saying that lyrics don’t help, but that’s just a quality I find with Lia’s voice that makes her one of my favorite anime-related vocalists. As for the person who you mentioned, to each their own. I’d be interested in listening to his rationale behind why he dislikes it. I wonder what does the back-vocal(?) sing along with Lia in TORCH. I thought that the backup vocals said “To feel your heart” but that’s just me. “That’s just me” 🙂 So you aren’t sure, either. The lack of “l” in supposed “feel” and the distinct “s” (if not “st”) in the supposed “heart” makes me think it’s not even english. I’m not an expert of the language though. Still, if it’s English, I’m much more confident compared to Japanese. It’s a pity they don’t put supporting vocal lyrics in singles’ cover. As is the lack of polyglots among my friends. Huh, I’ll chalk that up to my tendency to put the lyrics that sound vaguely like English words as actual English, regardless of what the lyrics actually say. Still, the “Fa-ar away” part you cited is in English, which means a possibility exists that the part we’re having trouble deciphering is also in English. Mind you, that Japanese people are singing English words means that unless the enunciation is clear (and in this case, it’s really hard to make it out clearly), the lyrics could be interpreted to be anything. The Japanese accent does make it pretty damn hard unfortunately. i pretty much agree with everything you said. toki wo kizamu uta actually did make me cry when i found out the meaning of the lyrics and after i had seen certain episodes in the anime. the vocals are so powerful, it is a truly moving song. torch was actually a good song, but my problem was the cheerfulness. it really seemed inappropriate as an ending at times when the episodes are really sad. dango daikazoku was much more versatile for the different atmospheres in the episodes. Glad you enjoyed this review and your statements are spot-on. I think Torch will forever take flak for pushing the viewer out of the mood of the anime. There’s one episode in particular where I wished they’d just revert to Dango Daikazoku because it would have heightened the effect of the final scene that much more. I think Toki wo Kizamu Uta is a very emotionally powerful song. I was wondering if you knew much about the timing in this song. I’m fairly sure the verse is in 7/4, but changes to 4/4 somewhere before the chorus and the quiet bit is in 5/8 or something??? When I listen to the OP I try to figure it out but I get lost :-(. If you know anything that would be great. Thanks! When I tried tapping out the verses, it sounded like it was in 3/4. 7/4 just seems a bit too unusual in this instance. As for the chorus, it sounds like it’s in 6/8 or something. Which is almost the same as 3/4. So yeahhhh, not 100% sure. I’d have to ask Aftershok to confirm. …and I think there’s some extra ones, that’s why I thought it was in 7/4. Like, there’s one after “miteru yo” and two after “hajimaru yo” (blue arrows). Of course, that’s one + two = three extra beats which could mean the whole verse is in 3/4, but then the emphasis falls on the wrong beat. i.e I think there’s a 1 beat bar after “miteru yo” and a 2 beat bar after “hajimaru yo”. Still think the chorus is in 4/4 though. Actually, you are both correct and incorrect. I transcribed the verse, chorus, and the transition section after the chorus, and the meter is actually a mix of 3/4, 4/4, 5/4, and 5/8.